Happy Monday everyone! We had some beautiful weather move into the St. Louis area this weekend (50-60’s!) and it’ll continue through today. But, my poor daughter fell ill with a nasty virus on Saturday morning and she missed her weekend long dance convention. We stayed cooped up in the house most of the weekend, which is kinda relaxing… but, also kinda not when you have a sick kiddo! Oh well! 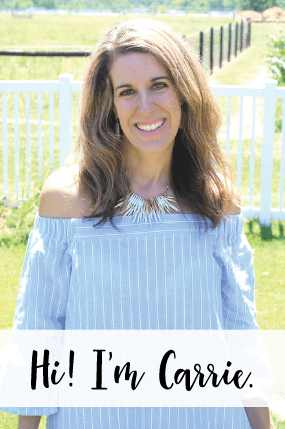 Today I’m joining The Blended Blog (TBB) for their monthly TBB Asks series, which I just love! Today’s theme is a good one, it is a Q&A on Relationships. Let’s get started! One: Who is your oldest friend/how did you meet? Becky is next to me in this photo and Terri is in the far right. 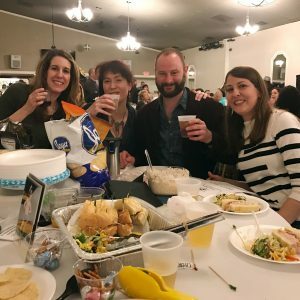 This was at a trivia night for Autumn’s dance school. I wish I could eat all of that yummy food again! Two: Tell us about your circle of support. Who are your people? 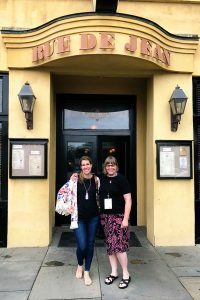 I would say my husband, mom, Becky, Terri, my friend Lauren (who I met through blogging and text daily… we also met at Haven last summer!). 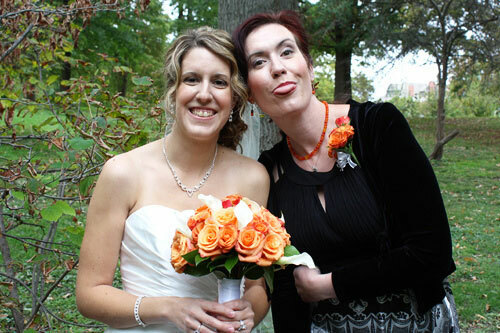 I hope to see Lauren again soon, it is such a bummer we are so far apart! I’m in St. Louis and she’s in New Jersey. I don’t have a TON of close friends… not like I did when I was younger. Life has just been SO busy. I’m sure when the kids get a little older, I’ll have more time to spend building up relationships again with other women. Right now… it’s hard to get together with my friends more than once a month (as I said above). I probably could make more of an effort, but I am such a homebody, so that doesn’t help either. Three: How did you meet your husband? I’ve known Brian for most of my life! We started to talk on the phone a lot when I was 12 (probably for 8 months, every night!) and then on my 13th birthday my mom let me go on my first date ever with a boy (Brian). We went on this riverboat with Brian and his parents. Brian gave me a little peck on the lips when we went on top of the boat and he truly sealed the deal with me right then and there, I couldn’t forget him! Sadly, his mom thought we were getting too serious so I think we went on one more date and then he broke it off with me right before I went to a NKOTB concert with some friends. I was SO sad! I remember listening to Eternal Flame by the Bangles and thinking of him. For some reason, I just never got him out of my mind… ever. We reconnected 20 years later on Facebook and WOW the fireworks went off. We fell madly in love all over again. It didn’t take long for him to propose to me in Paris under the Eiffel tower (!!) and he’s been my best friend and soul mate ever since. I really can’t imagine life without him in it, he is the real deal for me. I knew it when I was 12 and I still know it now. 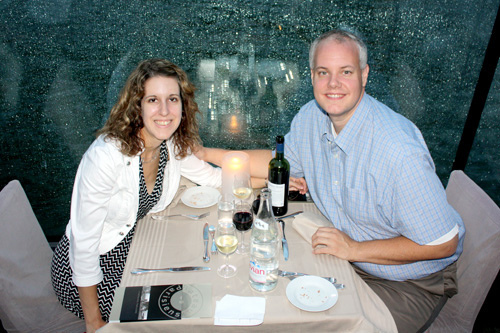 🙂 The photo above is of us on a glass boat on the Seine River our first evening in Paris. I didn’t know Brian was going to propose yet here! Ha, ha! We really need to go back to Paris again soon. 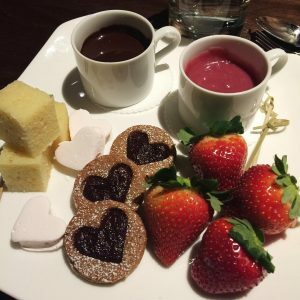 Four: How is Valentine’s Day celebrated in your home? Brian and I usually go out to dinner the weekend before or after Valentine’s Day, it is rare for us to go out to dinner ON Valentine’s Day. He always sends me flowers and we exchange gifts. I always get the kids some chocolate/candy and small gifts. 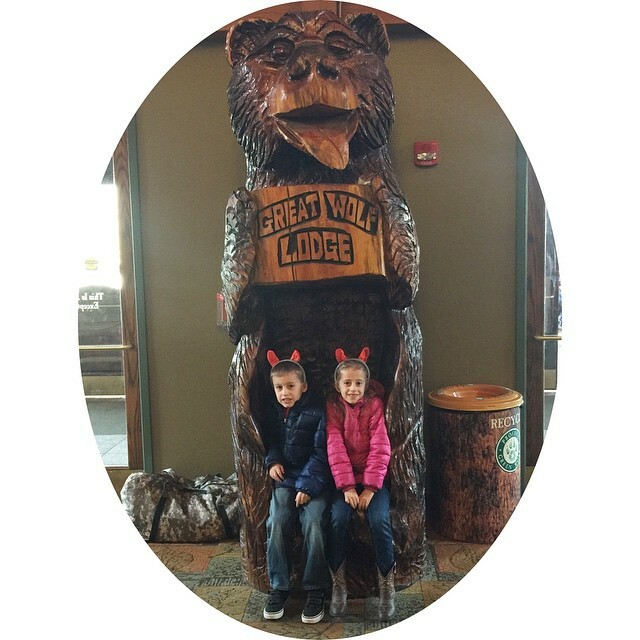 One year we spent Valentine’s Day at the Great Wolf Lodge. That was fun! Brian and I went to the Ritz a few years ago on Valentine’s Day and it was my first time there. This was our dessert at dinner! Lovely, right? 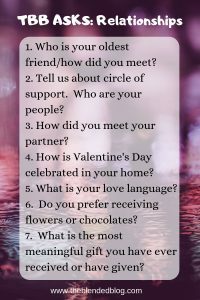 Five: What is your love language? I tied with 8 points on Physical Touch and Words of Affirmation. I tied with 6 points on Quality Time and Receiving Gifts. I received 2 points on Acts of Service. I know my absolute favorite used to be receiving meaningful gifts when I was younger, but as I’ve gotten older I really just enjoy being present with the one I love. 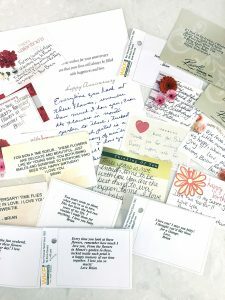 Special love notes or words spoken to me… compliments. Physical touch is important to me as well! I need to have my husband take this quiz again (we did when we were first married). I am curious to see what his love language would be… I think I can guess a little! Six: Do you prefer receiving chocolates or flowers? I really love chocolate, especially chocolates with caramel in them. BUT… I do love flowers even more! My husband went out of town twice in January and surprised me with flowers on both trips! I was smitten! What I love even more than the flowers is the sweet card attached to the flowers. Brian always writes something so sweet and thoughtful on the card. I’ve kept every.single.card. The photo above shows just some of them! Ha!! Does anyone else’s husband do this and do you keep the cards?! Seven: What is the most meaningful gift you have ever received or have given? Ok, so this question says ‘Meaningful’ gift… I can think of a lot of gifts that I’ve received and LOVED, but they didn’t really have a lot of thought behind them. Such as my FIRST ever digital camera. A full day at the spa with lunch? That was pretty darn nice, too. But, meaningful? I had to think a little harder on that one. I’d say my husband Brian has blown me away with meaningful gifts. 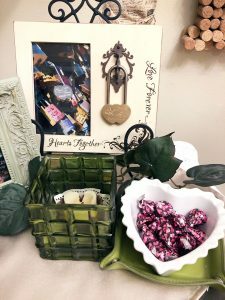 The photo above shows a gift he gave me in the first couple of months we were dating. 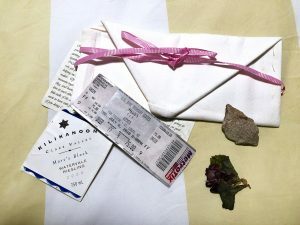 It has a napkin from the restaurant we went to on our first date, that he stitched into an envelope, a wine label from the wine we had at that dinner, a dried rose (I can’t remember if this was from some flowers he gave me?) and a stone he found at a park we had gone to. Included in this was the sweetest letter ever, where he just poured out his heart to me. YUP. I’ve kept this and I look at it occasionally and it always puts a big smile on my face. Another wonderful gift my husband gave me was on our wedding night. I had no clue about this… When we were in Paris and he proposed to me, we went to this bridge (Pont des Arts Bridge) on the Seine that had all of these locks on it. We didn’t even know about this bridge until we happened to walk across it and we had wished we had a lock to put on it. (I believe they’ve removed all of the locks on it, due to the weight. Boo.) On our wedding night, he surprised me with a lock that we locked together and placed on this frame. It has our names on it and our wedding date. He also hired a photographer that he mailed a second lock to and she locked this lock on our bridge and took photos of it. So romantic, right? Whenever we are in Paris again, we’ll have to look for it. But, I really think they took all of the locks off the bridge. So sad! Well, I had a lot of fun writing this post. I hope y’all enjoyed reading it! Happy Monday… enjoy your week!